Opt for a high quality product with a 30-day money-back guarantee. 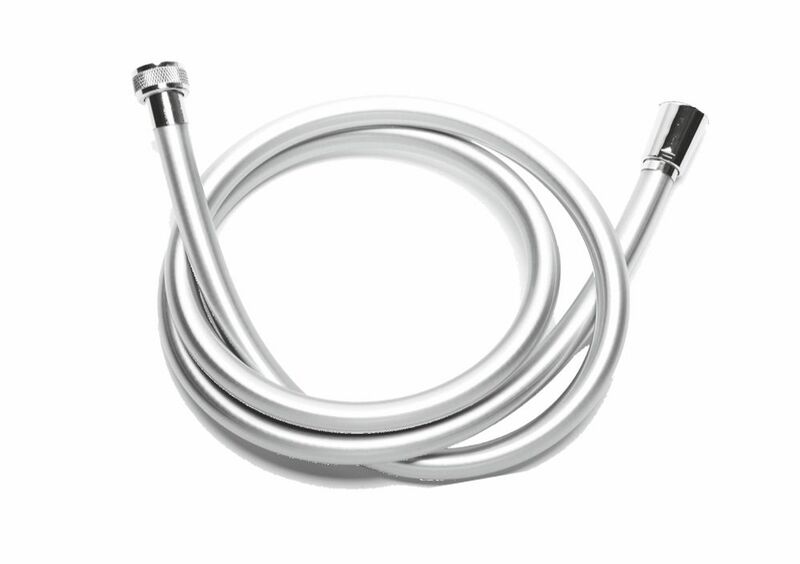 This shower hose will bring you many years of joy! To come straight to the point: If you're satisfied with your old shower hose – keep using it! 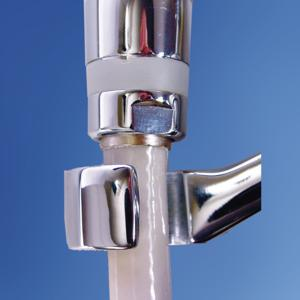 AquaClic shower heads fit the standard ½-inch thread found on every shower hose. But once you've tried out the AquaClic Flex, you'll never want to go back to your old hose. We guarantee it! The super-strong weave made from environmentally friendly polyurethane makes this shower hose care-free. The smooth surface means no more limestone deposits and soap residue. 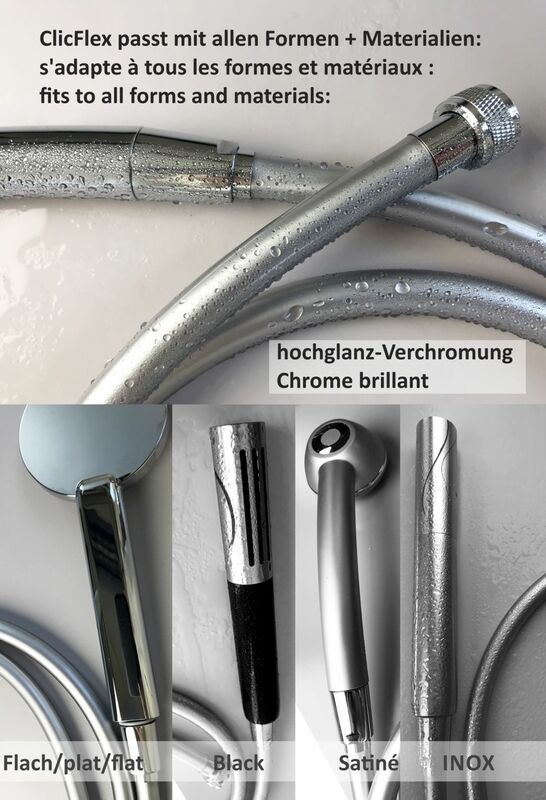 And with the Flex, scratched bathtubs (often seen where metal hoses are used) are a thing of the past. ...tightly in its holder. A silver-gray cuff of elastic material is incorporated into the coupling, ensuring a perfectly snug fit for different sized shower fixtures. 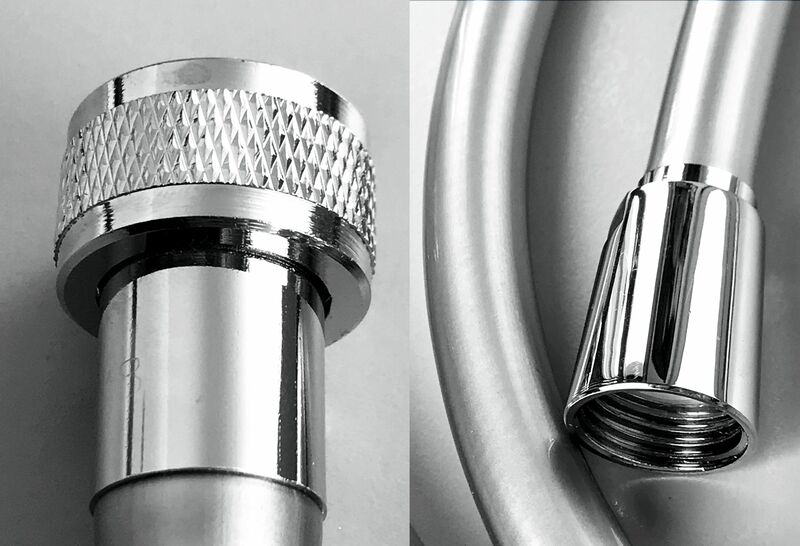 Elegance: The special long taper stylishly extends any showerhead. No more time spent tediously untangling your hose: the swivel cone coupling with the elegant cuff fits without tangling. Since 1995, Scandinavian countries have prohibited or heavily taxed the plasticizer PVC in products. So it was clear to us that we should search for the best alternative in that very region. 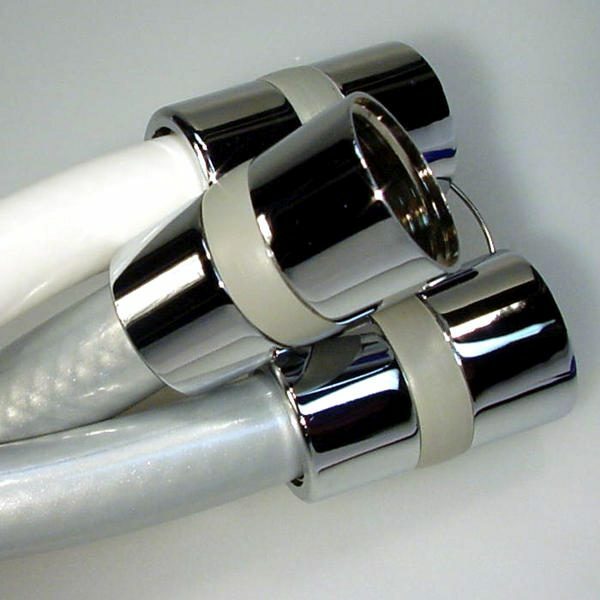 Thus the Danish-manufactured hose comes in eco-friendly PU (polyurethane). Weight: 290 grams / 10 oz. The expected delivery time is valid for all products unless otherwise indicated. In the event of advance payment, we will ship your product the day of receipt of payment. Within the EU, you will receive your order directly from Germany, from our logistics partner. * Visa, Mastercard, Amexco, Diners, JCB: in case that your payment was cancelled / charged back to us you agree to assume banking charges between CHF 85 and 200.- (any repayments e.g. for returned merchandise would be done via bank transfer or paypal). If you are already an AquaClic customer and want to give your opinion, we would highly appreciate it.